Join the rewarding dental industry with a career as a dental assistant. Many dental hygienists work part time with flexible schedules. If there is one career that will never go away that is that of a dental assistant. With everyone needing to go to the dentist you can see why this career has a good growth rate and is expected to grow at a fast rate. Find a certificate program below that fits your career goals. So what does a dental assistant do all day? As expected you would be working at a dentist office helping patients with their dental needs. Hygienists remove deposits from teeth (cleaning) and helps provide preventative care so that your teeth will remain strong. In some states you would be able to administer anesthetics in order to carve or put in fillings. You're the first thing that a client sees when they come into the office for a routine checking or when they have a problem with their teeth and this is a very important position within the dentist office. It does vary widely from office to office, but there are full-time, part-time as well as flexible schedules at dentist offices. More than half of all workers only work part time which is less than 35 hours per week. Typical hours of operation is 8am to 5pm and on weekends except for Sunday. The increasing population growth will stimulate demand for dental jobs. More and more dentists are noticing that they need more assistants in order to perform preventive dental care such as bi-yearly cleaning. This will allow them to devote their own time to more profitable procedures. Above and to the right you'll find some great programs that we have suggested that you look into if you're considering a career as a dental assistant. 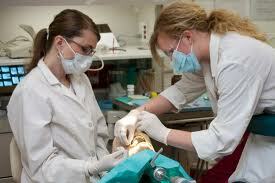 Dental Assisting is a great place to start and advance one's career with additional training. The potential to work into higher paying jobs is excellent and the need for qualified Dental Assistants is great, especially as the population ages. A certificate course in Dental Assisting usually takes about one year, although there are accelerated programs where one can finish in as little as eight months. There are also two year programs for A.A. degrees available at Community and Junior colleges. There are also accelerated programs that can be done on line and lead to a certificate. Certification requirements vary by state and are regulated by each state. According the American Dental Association, "87% of dentists offered reimbursement for continuing education courses taken by their Dental Assistants." So what type of work do Dental Assistants do? Primarily they are the dentist's second set of hands and do whatever is necessary to help the doctor with his or her job. This can include cleaning and sterilizing instruments, taking x-rays, preparing patients to be seen by the dentist, and being at the patient's chair side to help in any way necessary during a dental procedure. Dental Assistants also give patients instruction in proper oral hygiene and care, and may be involved in office work such as scheduling and billing. They are responsible for keeping the exam room clean and preparing it for each new patient, and making sure instruments and materials are in place for the dentist or hygienist. A career as a Dental Assistant may be right for you if you are a generally upbeat people person, like working with others, have a desire to help others, and are able to follow specific instructions and procedures. Classes to take in high school to prepare for this field could include science courses such as biology, chemistry, and anatomy, and office procedures-type classes. A career in Dental Assisting offers the potential for steady and stable employment in almost any sized community. Even the smallest of towns usually have dentists and orthodontists that will need assistants. Even greater opportunities will be available in larger cities; possibly in multiple provider offices, dental schools, or any number of other possibilities. Everyone requires dental care, thus it is a job that is pretty recession-proof and stable. Also, Dental Assistants report extremely high job satisfaction. This could be from the wide variety of duties assigned, which keeps the job interesting, or from the enjoyment of working with people and helping others. Additionally, the pay is very good, especially considering the length of training required. Opportunities for advancement are also excellent with additional training. The goal for any training program is for you to be fully trained as a dental assistant once you graduate. Many of schools offer both a certificate as well as degree program. Below are some of the skills and courses you’ll take during your training. Dental Terminology – You’ll get trained on how to use correct dental terminology. This will include how to properly pronounce dental terms that are used by the dentist as well as the dental community. Preventive Care – One of the more important roles of a dental assistant is to teach patients how to properly take care of their teeth. You’ll learn about the different factors that cause tooth decay and how to explain those factors to your patients. Get trained on fluorides, mouth guards for whiting teeth as well as he use of proper brushing. X-Rays – No training program would be complete without an introduction to x-rays. You’ll need to understand not only why x-rays are used in dentistry but what do look out for. One of the more important aspects is the full understanding of the dangers of giving x-rays. Dental Tools- One of your rolls as a dental assistant is to understand how to properly use dental tools. Not only will you need to know how to use certain ones but your dentist will need an assistant that is fully trained. Labs – One role for all dental assistants is how to properly prepare the exam room for the patient. This includes how to fully sterilize all the dental equipment as well as other more routine duties such as chain side tasks. Most of the schools offer both classroom training but they can also include hands-on lab work. During these labs you’ll be taught in an actual dental setting using all the equipment you’ll be using during your job. When looking at schools it is important to realize that once you graduate you still need to pass your states licensing requirements. Most of the schools build their dental program around the states requirements. If you want the ability to take x-rays then you’ll want to find a program that trains you to pass the CDA exam. The exam is multiple choice and often you’ll be able to take a prep courses at the end of your program or they will give you preparation materials you can take home. Be sure to check with your state agency first to learn what requirements are necessary. Finding the Best Dental Assistant School? We make finding the right dental assistant training program easy. When looking for a school the first thing to realize is that you’ll need to find a campus based program. This is due to the fact that you can’t become a dental assistant with online training. It requires you receive hands-on training from experienced instructors. Accredited Schools – When looking at the schools listed you’ll first see that we only list fully accredited schools. We make every attempt to show schools in every state so make sure to review the schools to see if they offer a training program near you. It is important that you only attend an accredited school as it will protect you as a student. Student Feedback – One of the most important factors we always want students to review about the school is any feedback they can see online. Sites like Google+, Yelp, Facebook and others are great places to actually connect to others that are current students. This will allow you to interact with current dental assistant students at the school in order to ask questions. Program Length – When looking at a dental assistant program you can expect most of the accredited training programs to be between 6-12 months in length. The reason why some classes are longer than others is they might include an externship or cover additional modules and areas that aren’t covered by shorter programs. This doesn’t mean the program is any less in terms of value, it might mean they train slower. Also some programs might be nightly vs 2-3 times per night or the program could be an hour vs 2-3 hours per night. Make sure you review the expected graduation dates give you by your Admissions Advisor when you visit the campus.